The folklore known as The Kalevala has bewildered scholars since it was first transcribed from the songs of Finnish and Russian bards over 175 years ago. Little is known of its origins, characters or the Sampo, a mysterious artifact that has confounded academics and fuelled speculation that it may have been the Grail, the Tree of Life or the Ark of the Covenant. The extraordinary story also contains references to shamanism, felled oak trees and sacred bees, whose magical honey is sourced from far away planets for use in resurrection rituals. The question remains: did the Kalevala chronicle an ancient and supernatural saga, or might there be another explanation? 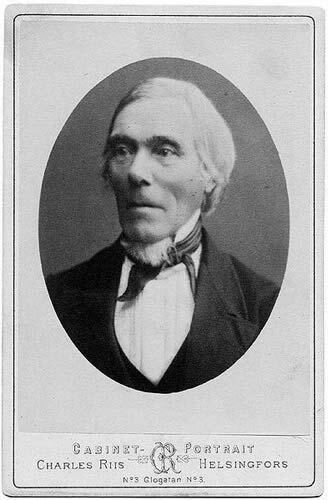 Elias Lönnrot (1802 – 1884) was a physician turned linguist who, in his capacity as the district health officer, travelled to the region that straddled the present border between Finland and Russia in search of his country’s cultural identity, for Russia had annexed Finland in 1809 and nationalism was perilously low. Heroically, he found it. Between 1828 and 1843 Lönnrot travelled to the region no fewer than 11 times, transcribing the songs which were sung by the village elders. 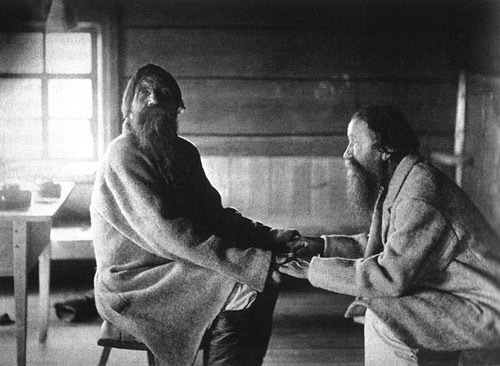 Most were performed by two men who sat face to face, holding hands, alternating verses and swaying to the music, as if in a trance. The antiphonal singing, as it is known, has its roots in antiquity, in the singing of psalms, which was popular in both Hebrew and Christian liturgies, and which is recorded in the Old Testament, being but one example. In Lönnrot’s day, however, the tradition had all but vanished. Solo performances had replaced duets and women sang songs that had previously been reserved for men. 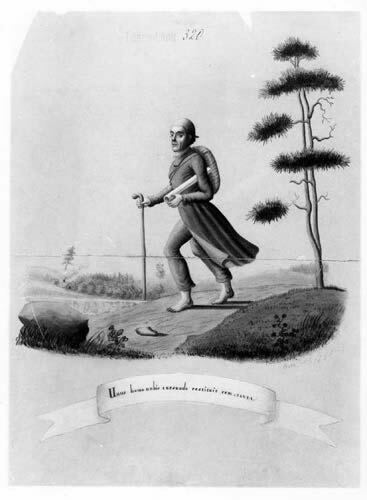 It was not until his fourth trip, in 1833, that Lönnrot began to suspect that the songs he was recording might comprise a singular historical prose. Lönnrot embellished the songs he was amassing and some, such as the Finnish historian, Väinö Kaukonen, believe that he altered as much as half of the epic while authoring another 3%. Still, this seems about right, given the arduous task of weaving the songs into a coherent narrative. This could not have been easy, for the songs, apparently set in first millennium AD Finland, depict creation myths that are thousands of years old. The Kalevala, which is sometimes branded as an older, Finnish version of Beowulf (an epic poem that derived its name from ‘bee wolf’ – a bear, the natural enemy of bees) consists of 50 cantos and 22,795 lines of poetry. The work is a national treasure and has been translated into dozens of languages. Nevertheless, we must ask: does anyone truly understand what it is all about? The Kalevala assumes that the reader understands its bizarre plot. It begins with creation. The earth is spawned from a duck egg and the first man, Väinämöinen, a water-god turned shaman, is born of the goddess, Ilmatar. Väinämöinen brings life to a barren planet by creating trees and introducing agriculture. Although a god, Väinämöinen is hopelessly human and his obsession with obtaining a wife dominates the storyline and catapults him and his colleagues on a hero’s journey to Pohjola, the shadowy land of their rivals to the North, and the home of a witch named Louhi who seeks to protect her daughters from the bride-obsessed southerners. Louhi was a powerful priestess who oversaw the northern territories. Not surprisingly, historical accounts confirm that this very region was home to a tribe of women who mounted men’s heads on poles as prizes of valour. The ancient name of the region was Kven (‘Woman Land’ in Old Norse) and many communities, such as the Sitones, confirm the presence of ‘Amazonian’ women in the region. Interestingly, Kven has also been translated as ‘swampy land’ and the Kalevala contains a plethora of references to seas, rivers, lakes and swamps. As the story progresses, Väinämöinen proposes to the Maiden of the North, but is rejected. Undeterred, he encounters a young man named Joukahainen who, having lost a duel with Väinämöinen, promises his younger sister in marriage as a concession. Tragically, she takes her own life to avoid becoming his bride. Dejected, Väinämöinen agrees to commission a ‘Sampo’ for the people of the North in return for a wife, but it is not he who is skilled in metalworking. Enter Ilmarinen, the protagonist of the story and another Finnish hero who obsesses about finding a wife. 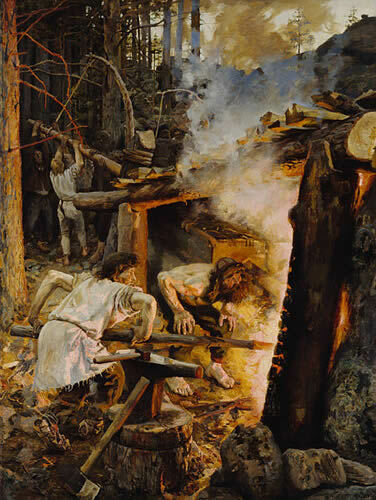 Ilmarinen, who is credited with having forged the sky, appears to be the world’s first artificer and may, in fact, be the archetype for Tubal Cain, the little understood figure whom historian Flavius Josephus tells us ‘was very expert and… invented the art of working brass.’ Metalworking was considered a sacred, shamanic art that enabled the spirit to depart the metal when heated. And so Väinämöinen persuades Ilmarinen to forge the ‘lid of the sky’, the ‘mighty Sampo’, so that he can barter it for their brides. Trial and error ensues, but Ilmarinen perseveres and succeeds in producing the Sampo, which he and Väinämöinen present to the people of the North, as promised. Disappointingly, the men leave without taking a wife. Later, a handsome young man by the name of Lemminkäinen proposes to the Maiden of the North and is assigned a series of tasks in order to prove his worthiness, an act that recalls the twelve labours of Hercules. Although he dies while attempting the challenges, he is resurrected by his mother who summons a bee and commands it to travel to space to retrieve magical honey for her son’s resurrection ritual. The Kalevala is now in full swing. Might the Kalevala be accessing the source material that inspired the more familiar versions of the story? Might it actually be the source? The adventure continues. Ilmarinen travels to the North and seduces Louhi’s youngest daughter. Upon his return he notifies Väinämöinen of the prosperity the Sampo has brought the people of the North and, in a fit of jealousy, Väinämöinen, Ilmarinen and Lemminkäinen return and steal it. Louhi tries in vain to retain it, but the Sampo is destroyed and lost at sea. Her revenge is harsh. She unleashes disease and a gigantic bear. Then she hides the sun and moon and prohibits the use of fire. The Kalevala ends with the tale of the Virgin Marjatta, who bears a son after becoming impregnated by a lingonberry; a virgin birth that signals the Christianisation of Finland and the beginning of the end of the Pagan world. Väinämöinen attempts to kill the child, but the boy convinces him to spare his life and grows up to become the baptised King of Karelia. Christianity had replaced the old ways, and so Väinämöinen sailed away, never to be heard from again. One can’t help but wonder how Väinämöinen would have been received in new lands. Would he have resembled a god? He sounds a lot like Viracocha, the pre-Incan creator god and teacher who is said to have travelled North and whose name meant ‘sea foam’. Viracocha created the sun, moon and stars and travelled in a boat. He was a tall, bearded caucasian, and dressed in a long white robe, just like a shaman. Just like Väinämönen. The Kalevala’s main characters (Väinämöinen, Ilmarinen, Louhi) appear to be shamans, archetypes, or both. Each uses magic, transports between realms, and exhibits behaviour suggestive of a shaman’s journey to the lower, middle and upper worlds of consciousness. Many popular fairy tales have storylines that feature mortals who engage with supernatural beings and animal figures, a device which appears to be allegorical for shamanistic excursions to a world where such wondrous creatures are plentiful. Another curiosity is how the men of the South – characters such as Väinämöinen and Ilmarinen – obsess about obtaining a wife from the Northlanders, begging the question, why do they not have women of their own? One answer may be that the people of the South were shamanistic travellers with skills in metalworking. Sure enough, the ancient Finns had a language distinct from their Russian and Scandinavian neighbours. They were a distinct race, as noted by a first-century Roman historian who observed that the Lapps, the people of the North, were being displaced by an advanced race called the ‘Finns’ who spoke a different language. Shamanistic travellers, such as the Pictish tribes of Scotland, and similar tribes in Ireland, are known to have travelled in search of wives, for they too had no women of their own. The use of mtDNA (female lineage) and Y-DNA (male lineage) sheds further light on the matter and while Finnish mtDNA does not differ from other Europeans, Haplogroup U5, estimated to be the oldest mtDNA haplogroup in Europe, is found in significantly higher levels among Finns, Estonians and Sami culture, the latter, of course, being renowned for their shamanism. The analysis supports a theory proposed in the 1990s by Kalevi Wiik, a professor of phonetics at the University of Turku, who argues that the Finns lived during the Ice Age in refugia in the region of Southern Europe. 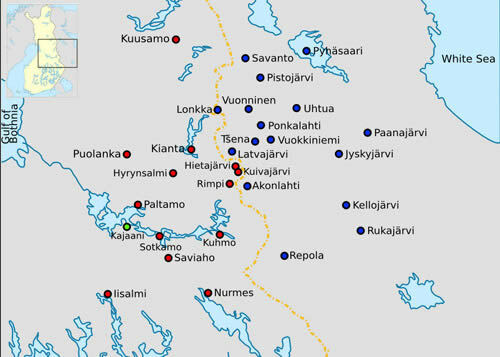 Wiik believes that Finno-Ugric speakers spread north as the ice melted and populated central and northern Europe, spreading the discipline of agriculture to hunter-gatherers. Might this explain why Väinämöinen appears as god of agriculture? Could Väinämöinen have been Viracocha? The identity of the Sampo remains the biggest mystery in the Kalevala. This stems, in part, from the fact that it is introduced without explanation, prompting speculation as to its identity. Many believe it was the Ark of the Covenant, due to its magical powers and ability to bring prosperity to its people. Most believe it was the World Tree or Pillar, due to the word ‘Sampo’ deriving from the Sanskrit word ‘skambha’, meaning pillar or pole, otherwise known as ‘irminsul’, Old Saxon for ‘mighty pillar’, ‘arising pillar’ and the ‘All-Pillar that holds up the Universe’. Others believe it was a forged Vendel-era (550-793) shield, a fanciful compass, or the Golden Fleece. In the 1960s it was believed to be the Northern Star, a magic drum, or a shamanic bringer of spiritual abundance. The Sampo resembles the Cornucopia of Greek mythology, which provides abundance to its people, a quality that has linked it to the Grail. The mill Grotti of Nordic mythology is another artefact that has drawn comparisons. It, like the Sampo, produces salt, peace and happiness. Surprisingly, the book that should have known better, the seminal Hamlet’s Mill, states that the ‘Sampo is nothing but heaven itself.’ Regardless of the uncertainty surrounding its identity, the characters in the Kalevala know exactly what it is. This, I feel, should draw our attention to the possibility that the Sampo may have been a natural phenomenon. Clearly, the Sampo lives in the sky; in fact, in several passages it is referred to as a ‘mill’ that makes a grinding noise. The astrological implications are clear: the Sampo is a reference to the passage of time as depicted in the stars and, specifically, the precession of the equinox. This is what a ‘mill’ symbolised to the ancients. But does that explain why the Sampo is coloured, bright and noisy? I believe the Sampo may have been the Northern Lights, the Aurora Borealis, a multi-coloured phenomenon in the sky that is witnessed in northern latitudes – the domain of Pohjola. The multi-coloured phenomenon was named by the French priest turned astronomer, Pierre Gassendi (1592-1655), in 1621. 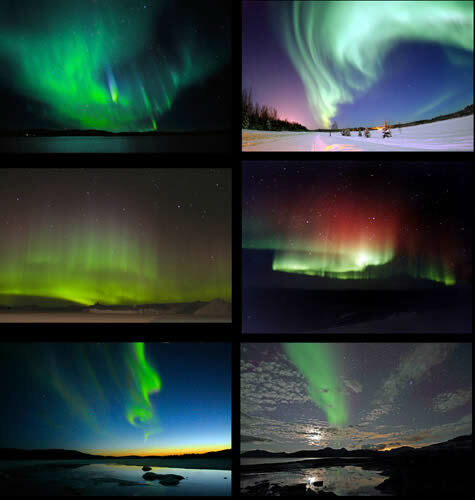 He called it the Aurora Borealis after the Roman Goddess of dawn, Aurora, who flies across the morning sky, regenerating and announcing the arrival of the sun. The celebrated goddess was featured in the works of Shakespeare, Thoraeu and Tennyson. The second part of Gassendi’s name, Borealis, is Greek, meaning ‘of the northern wind’ (Boreas being the Greek word for the northern wind). The name Aurora Borealis describes the Sampo perfectly, for after the Sampo is forged: ‘The wind bore them to the Northland.’ Today, the Aurora Borealis is also known as the Northern Lights. The Aurora Borealis is triggered by atoms returning from an excited state to ground state along the earth’s magnetic fields. The emission of oxygen and nitrogen produces the green, brown, blue and red colours we see in the sky. 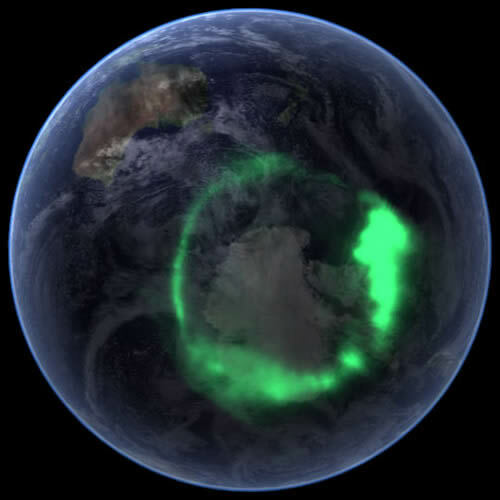 The earth’s magnetism is a vital contributor to the Aurora Borealis and is thought to be the source of other anomalies, such as ley lines and power places. The Aurora’s electric matter is believed to have similar properties to the electric galvanic battery. Auroras have even been observed on Jupiter and Saturn. The solar wind that flows past the earth also contributes to the Aurora Borealis. The ‘auroral zone’ refers to the 2,500 km region around the earth’s magnetic pole, where the colourful lights are most frequently observed. Furthermore, satellite images reveal a ‘ring of fire’ that is most pronounced at midnight. Recent scientific studies have added credence to my hypothesis that the Sampo may have been the Aurora Borealis. Aalto University in Finland has confirmed that the Northern Lights make a ‘clapping’ sound, discernable a couple of hundred feet above ground. This is fascinating, for the Sampo is said to have made a similar noise. In comparative mythologies, the ‘mill’ (with which the Sampo is associated) makes a ‘grinding’ noise, and in the Kalevala we learn that the Sampo ‘grinds one measure at day-break’ and makes a ‘clattering’ sound. Might each be referring to the Aurora Borealis? The Sampo brought prosperity to the Northlanders, prompting the Southerners, the people of Kalevala, to steal it. If the Southerners built the Sampo, then why was burglary necessary? Why could they not make another? One explanation is that the Sampo was special and, like the sky, there is but one. Both were built by the sky god. If the Sampo is the Aurora Borealis, and if it was coveted by ancient people, then we should find reference to it in the legends of people who lived near it. The folklore of many northern cultures suggests that the Aurora Borealis is blessed by the gods. The Cree called it the ‘Dance of the Spirits’ and the Laplanders believed it was the realm of the dead, especially those who had died young, violently or tragically. The Vikings believed the Aurora Borealis consisted of beautiful maidens, called Valkyries, who escorted those killed in battle to the throne of the gods. Scottish tradition maintains that it is the kingdom of ‘Heavenly’ or ‘Merry Dancers’, supernatural beings that fought for the favour of beautiful women in the heavens. The belief that the Aurora Borealis embodied sprits is echoed in the traditions of the Inuits of Greenland and northern Canada who believed the spirits were playing soccer with a walrus skull that made a ‘clattering’ sound with its jaws. The Laplanders also believed that the spirits of the Aurora Borealis could influence the weather, and rituals were created to summon the spirits in order to produce good weather. The Inuit of Alaska believed the multi-coloured lights were the divine spirits of the animals they hunted. The Finnish name for aurora is revontulet, meaning foxfire, and it was thought that foxes frolicked in Lapland and their auroras were sparks given off by their fur. Other northern cultures, in particular Småland, a region in south-central Sweden, believed that swans challenged each other to see who could fly the furthest north, and the winner became frozen in the sky, giving rise to the Aurora Borealis, as the swans flap their wings in an attempt to break free. This is interesting, for the Kalevala contains many references to foxes and swans, including a mention of swans in the act of forging the Sampo, i.e. ‘from the tips of white-swan feathers.’ Swan tips are a symbol of the spirits’ transcendence into the material world. This is especially interesting, as Swan in Swedish is svan, which comes from the Indo-European root swen,meaningto make noise or to sing, just like the Sampo made a grinding or clattering noise. Today, the whooper swan (Cygnus cygnus) is the national bird of Finland and five flying swans are the symbol of the Nordic countries – the realm of the Aurora Borealis. In Norse mythology two swans drink from a sacred well in the realm of the gods. Cygnus, Latin for swan, is also the name of a famous constellation that remains one of the most recognisable constructs in the northern summer sky. The swan’s popularity was likely inspired by the swan in the Kalevala that lives in the River Tuoni, in Tuonela, the realm of the dead and the place of last judgment. Tuonela is also where Väinämöinen travels to obtain spells. In an almost identical fashion to the Charon, the ferryman of Hades who carries souls of the newly deceased across the rivers Styx, Väinämöinen meets a ferrywoman named ‘Tuonen piika’ meaning ‘death’s maid’. Jean Sibelius, a famous Finnish composer who was instrumental in reviving Finnish nationalism and Freemasonry, each of which had suffered during the Russian sovereignty, composed the Lemminkäinen Suite, based on the Kalevala, and named the second part The Swan of Tuonela. The work features Lemminkäinen, who has been tasked with killing the swan of the underworld, but is shot with a poisoned arrow and dies before he can complete his quest. 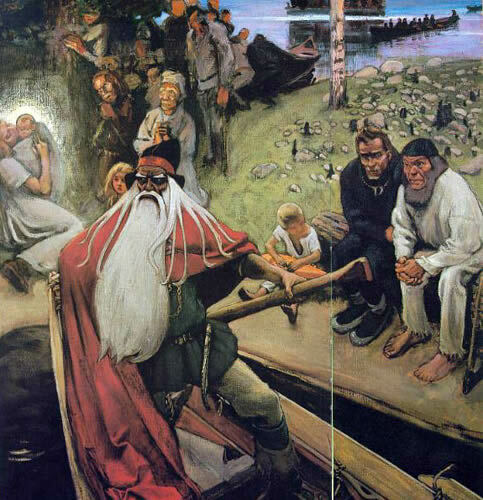 Like so many characters in the Kalevala, he is later restored to life. North American and Scandinavian elders believe that the Aurora Borealis can be summoned by whistling, but to do so can bring dangerous consequences. They also recall being told, as children, to behave respectfully in the presence of the colourful lights. One story recounts how a man from Norway teased the Aurora Borealis, which promptly killed him. Other similar stories recount how children were only allowed to be in the presence of the Aurora Borealis if they wore hats, should the aurora burn off their hair. Red auroras were thought to be a bad omen and were often mistaken for forest fires. This belief is reinforced in modern times by cultures that rarely witness the phenomenon. The Northern Lights appeared in London in 1939, just before Germany’s blitz, as they did in the Unites States, in Cleveland Ohio, on 7 December 1941, the day Japan attacked Pearl Harbor. The Point Barrow Eskimos considered the Aurora Borealis to be an evil entity and carried knives to defend themselves. Even the Chinese believed the Aurora Borealis represented fighting dragons of good and evil. So, was the Sampo an ancient name for the Aurora Borealis, the Northern Lights? There is ample evidence to suggest that it was. To fully explore the shamanistic and astral symbolism of the Kalevala would require more time than allotted here. Needless to say, the epic is inspired by shamanistic journeys and astrological events in the night sky. For example, there are numerous references to the constellation Ursa Major, or the Great Bear: ‘He sang the Great Bear on to its boughs,’ and ‘from her breasts the sun beamed the Great Bear from her shoulders,’ as well as, ‘Then the smith, Ilmarinen, climbed high in the tree; up, up heavenward climbed to fetch the moon, to take the Great Bear out of the spruce topped with gold.’ There are also references to the constellations of Orion and Taurus. There are several stories in the Kalevala about the cutting of oak trees and one involves a boy, an agricultural spirit, whose name, Sampsa, is believed by scholars to have derived from the biblical Samson. This is intriguing, as the Book of Judges contains the story of the Herculean figure, Samson, who wrestled and killed a lion before noticing that a swarm of bees had formed in its carcass, giving rise to the riddle: ‘Out of the eater came forth meat, out of the strong came forth sweetness,’ the answer being, ‘What is sweeter than honey, what is stronger than a lion?’ The bee, it appears, is involved in almost every aspect of the Kalevala. When the oak had been broken and felled the mean tree, suns were free to shine, moons were free to gleam, clouds to scud along, and heaven’s arches to curve on the misty headland’s tip at the foggy island’s end. Lönnrot names an entire chapter ‘Demon’s Elk’, and it is clear that the trees are not terrestrial, but rather celestial-inspired objects. The tree-felling accounts are reminiscent of the famous 1188 ‘cutting of the elm’ in Normandy, when a diplomatic altercation between the Kings of France and England resulted in an elm being cut down in the city of Gisors. Pierre Plantard, the alleged Grand Master of the almost certainly fictitious Priory of Sion, believed the event symbolised the split between the Knights Templar and the Order over which he presided. The bee is a prominent character in the Kalevala and features in moments of birth and resurrection. Once the world has been created we are informed: ‘“from the clouds dripped honey.’ The women of the north are coveted, not just for their beauty, but also for their culinary skills with honey: ‘she may bake honey bread, know how to brew beer.’ Shortly afterwards, ‘smith Ilmarinen was born’ and a ‘bee rose up from the ground… O bee, lightweight man, bring mead on your wing, carry honey on your tongue, from six flowery tips, from seven grass tops, for steel things to be made, for iron to be wrought… spill honey on the earth.’ Apparently, the bee is essential to the forging of the world. In ancient Egyptian, Minoan and Greek cultures the bee symbolised resurrection, as it does in the Kalevala. Lönnrot entitled a chapter ‘Resurrection’, and it contains references to bees. as well as to Thor, the Norse hammer-wielding god who is associated with thunder, lightning, storms and oak trees. 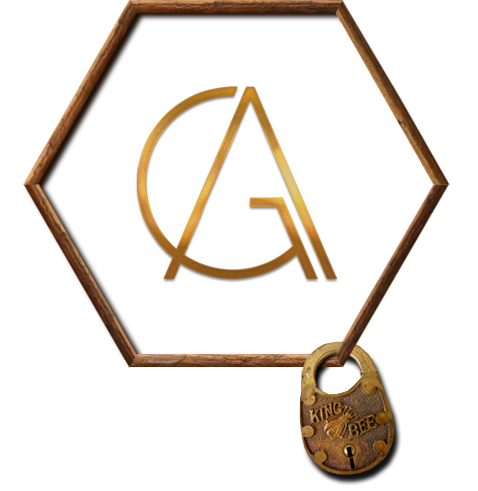 It also contains a story conspicuously similar to that of Osiris, the Egyptian god of resurrection, and bees. In Egypt the Pharaoh’s title was ‘Beekeeper’ and a bee was featured in the king’s cartouche. Not surprisingly, Osiris’s symbols included the bull, beehive and the White Crown of Egypt, which I believe was a beehive. This would explain why no Pharaoh has been found to be wearing the White Crown – it is biodegradable! Similarly, the Red Crown of Egypt (dsrt) may have represented the honey bee. Egyptologist, Wallis Budge, called the Red Crown Deshret, and deseret means ‘honey bee’ in the language of the Jardites, an ancient people who, according to Mormon tradition, travelled from the Tower of Babel to America with bees in their boats. Osiris’s White Crown was most likely inspired by the Mesopotamian god, Enki, who wore a similar, conical-shaped headdress and hailed from Eridu, the city where the Tower of Babel is believed to have existed. 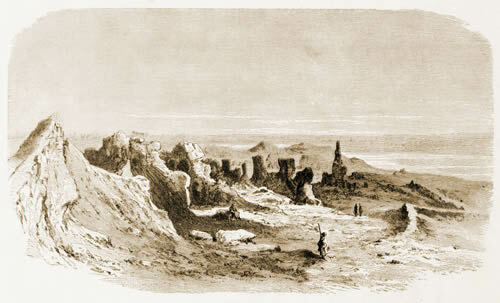 Babylon was also named Nunki, and this has led some to incorrectly conclude that Babylon was home to the Tower of Babel. Osiris was buried in the delta capital of Sais, in a sanctuary called the ‘Mansion of the Bee’, near the goddess Neith’s temple, which was known as the ‘House of the Bee’. Neith was the daughter of Ra, the Egyptian god who, the Pyramid Texts tell us, ‘cried bees as tears.’ Sais is situated in the Egyptian delta, a region known as Ta-Bitty, the ‘Land of the Bee’. This is where the legend of Atlantis originates, as recounted by Greek lawgiver, Solon, who passed the apocalyptic account he had gleaned from the temple priests to Plato. A philosopher by the name of Crantor, who travelled to Sais three centuries later, confirmed Solon’s account of an advanced civilisation that had been destroyed by a cataclysm. Remarkably, the Rosetta Stone (the key to deciphering Egyptian hieroglyphics) also came from Sais and was only later moved to Rosetta. So it (the bee) comes panting, travels doubled up, all its wings drenched in mead, its feathers in melted honey. She, Lemminkäinen’s mother, took the ointments and anointed the weary one, tended the ill-befallen; but no help came from them, no words came to the man. Bee, my little bird, fly that other way, right over nine seas to an island on the main, a honey mainland, to Thor’s new cabin, the Worshipful boundless one. There is pleasant honey there and good ointment there, which will suit sinews and be good for limbs. The honey was being cooked… in tiny cauldrons, in beautiful pans that would hold a thumb, fit a fingertip. The bee, slight man, got some of those ointments. The Creator sang charms and the pure God talked, the lord anointed his brood inured by an evil power. Dip your wings in mead, and your feathers in melted honey. You will get there easily, trip there handsomely, over the moon, underneath the sun, between heaven’s stars. For one day you will flutter to the moon’s brow-bones, for another you will whizz to the Great Bear’s shoulder blades, for a third you will soar up to the Seven Stars’ back; then ‘tis a mite of a way a tiny circuit to where God the holy lives to the blessed one’s dwellings. And so the bee flies to the ‘Almighty’s chamber’ (a reference that sounds suspiciously like the Ark of the Covenant) and returns with the ointment that allows Lemminkäinen’s mother to successfully complete her son’s resurrection. The use of honey in resurrection rituals is not surprising, for honey was used in the funereal practices of the Babylonians and the Egyptians. Even Alexander the Great is said to have been buried in honey. But what of bees flying to the far reaches of heaven and hell to retrieve magical honey? Bees and space are not as odd bedfellows as one would first think. 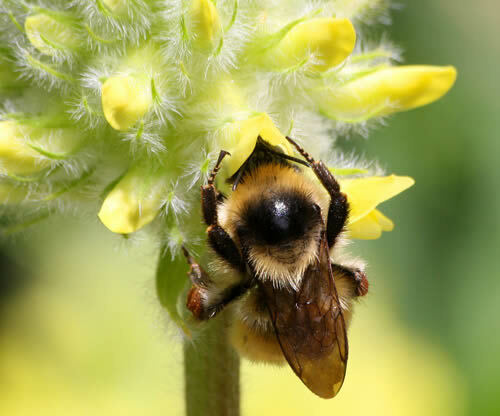 The third-century Greek philosopher and mathematician, Porphyry of Tyre, believed that souls arrived on earth in the form of bees, having descended from the moon goddess, Artemis, and that they were lured to terrestrial life by the promise of earthly delights, such as honey. Honey also had practical uses in the Kalevala and in a chapter entitled ‘Slaughtering and Brewing’ we learn how ‘brewer women’ sent the bee to a faraway destination to retrieve the desired honey ointment. There is also a peculiar reference to a bull and the number 1,000: ‘that great Finnish bull from Karelia was fetched to the edge of the North field… by the muzzle a thousand, held the ox as it was led.’ This is interesting, for Apis, a sacred bull in Egypt, means ‘bee’ in Latin (Apis is also the genus of the honey bee) and Taurus, Latin for ‘bull’, was the embodiment of Osiris. Egyptian mythology states that a thousand bees were born from a dead Apis bull. Curiously, there are many references to bees, bulls and the number 1,000. The Hebrew letter, Alef | Aleph, carries the meaning ‘thousand’, and its Proto-Sinaitic hieroglyphic depict a bull’s head. The Egyptian goddess, Nut, was the goddess of the sky and keeper of the title, ‘She Who Holds a Thousand Souls’, and her dress resembled rows of bees. Christ, the saviour archetype of Osiris, is written as QRST in Hebrew and carries the value 1,000. Might the Kalevala also contain a coded reference to the number 1,000, which appears to mean ‘Great’ or ‘Magnificent’ and is associated with bees and resurrection? In many parts of the ancient world honey was hallucinogenic and thus was frequently used in shamanic rituals to enter the realm of consciousness believed to be the abode of the gods, and the dead. Shamanic journeying, especially instances where hallucinogenic honey was used as a sweetener for bitter opium and heroin concoctions, produced altered states, such as those achieved by the Delphic priestesses, who communed with the gods only after consuming hallucinogenic honey; a practice that often resulted in blindness. Clearly, such a drug would have accounted for the ancients’ ‘return trip’ to the realm of the dead. Such is the odyssey of the Kalevala. All we can say for certain is that it appears to be an amalgamation of creation myths from distant epochs. Birth, death and resurrection are reoccurring themes, as symbolised by the bee, the felling of the tree and magical honey-based resurrection rituals. I believe that the mysteries of the Kalevala are natural in origin. However, to render the curiosities of the Kalevala as ordinary is not to marginalise them in any way. The wonders of human consciousness and the natural world are the true treasures of the Kalevala and possibly the greatest mystery of our otherwise everyday existence.